Hello there, today is a special day as the new Fun & Festive release from Simon Says Stamp is out today! They kindly sent me the new Tiny Words Christmas set to have a play with and I love it! It is such a wonderful sentiment set. I thought I would combine it with the amazing Lots of Snowflakes set that is an oldie but goodie, for some alcohol ink fun! I started off by creating an alcohol ink panel. I used some turquoises, blues and purples to create a background, sort of like the Northern lights. I set the piece aside to dry for a little while and then stamped the snowflakes from the Lots of Snowflakes set on top in a random pattern. 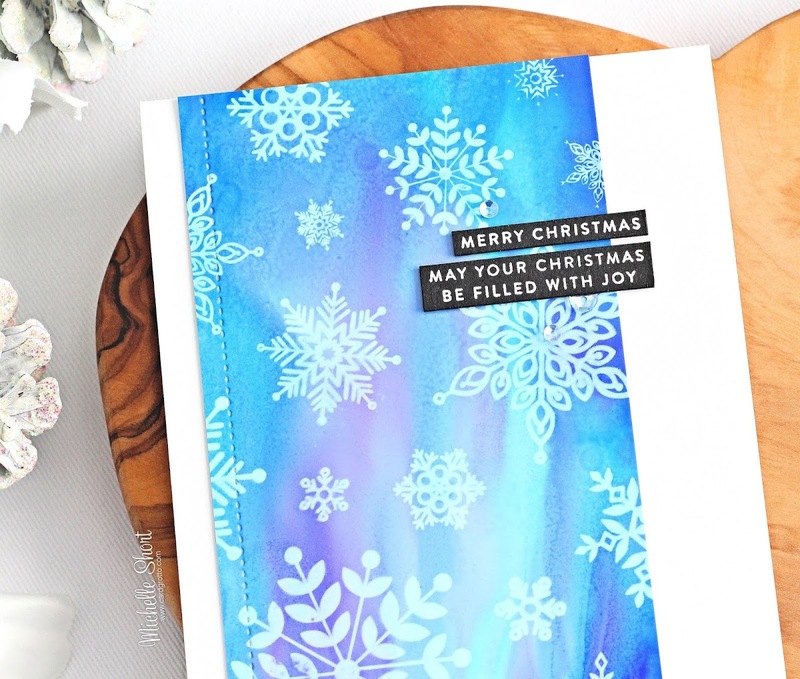 I used Alcohol Lift Ink for this and after stamping, I used a soft cloth to wipe off any excess ink of the Yupo paper to reveal the snowflakes. I did this twice to get a good impression. The panel was cut down and the left side edge cut with a stitched border die for some added interest. The panel was adhered flat to a white A2 card base with tape runner. I then took two of the sentiments from the Tiny Words Christmas set and stamped these on to black cardstock with Versamark Ink. I applied white embossing powder and heat set. These were cut in to thin strips and added to the card with clear foam tape. To finish off, I added a few Moonshine sequins. The great thing with using Alcohol Lift Ink is that you can use the left over alcohol ink that is on the stamps to stamp off on to 'normal' cardstock. 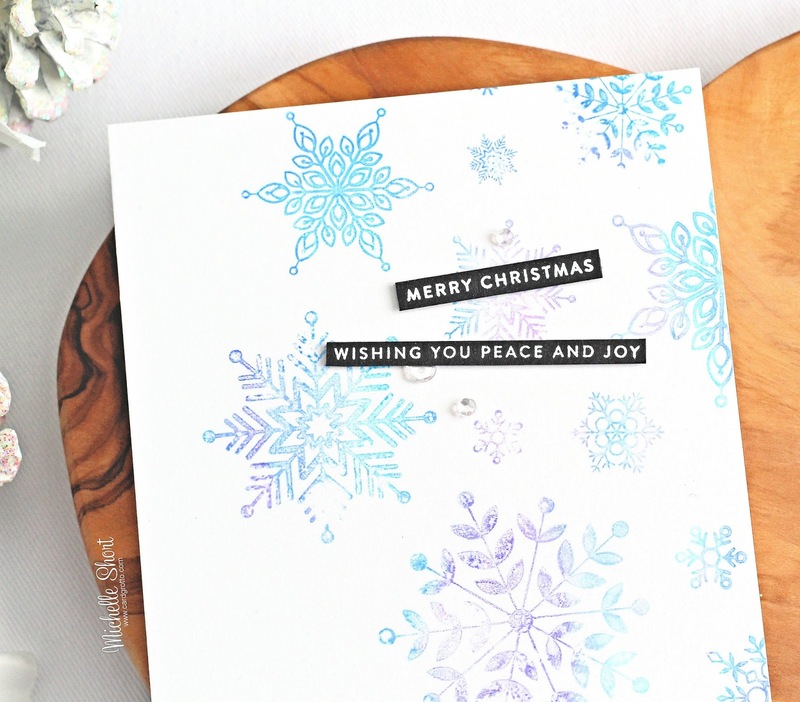 After stamping on to the alcohol ink piece, I then stamped on to white cardstock. The stamps were cleaned before inking up again to get a better impression. I then used the ink left on the stamps again to re-stamp the second piece. This stamping definitely isn't perfect, as you can see, but it still leaves a nice look and you can get two cards for one! The panel was simply adhered to a white A2 card base with tape runner. I then stamped and heat embossed two more sentiments from the Tiny Words Christmas set and added these on with more clear foam tape. I also finished off with a few more Moonshine sequins. I love the colours on these cards and the alcohol lift ink technique is really fun. Do check out the rest of the Fun & Festive release, it's a good one. Thank you so much for stopping by today, have a great day! Very pretty cards. I love the colors. I want to try this technique. 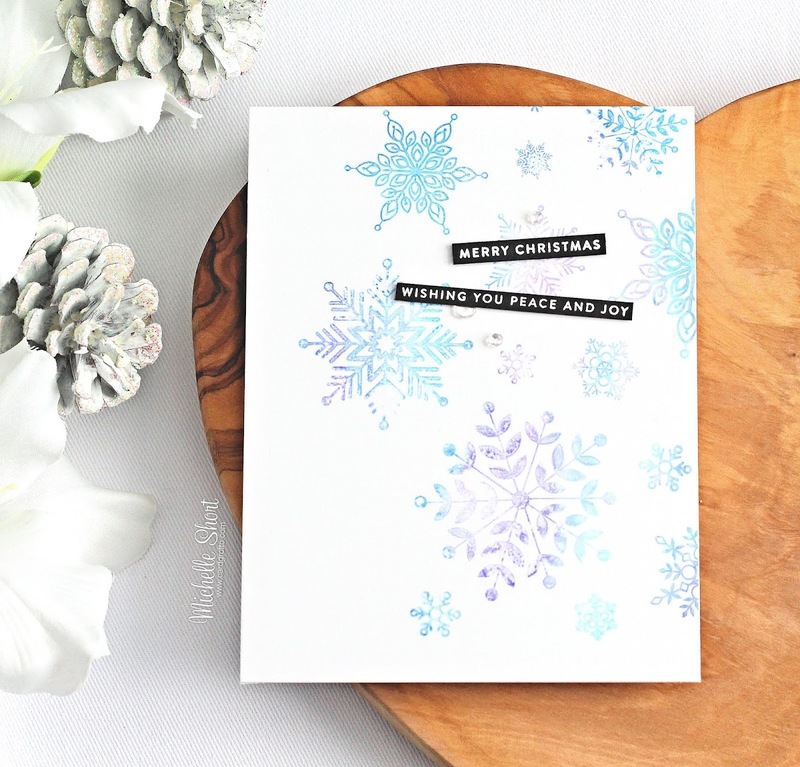 gorgeous cards...love those beautiful snowflakes! 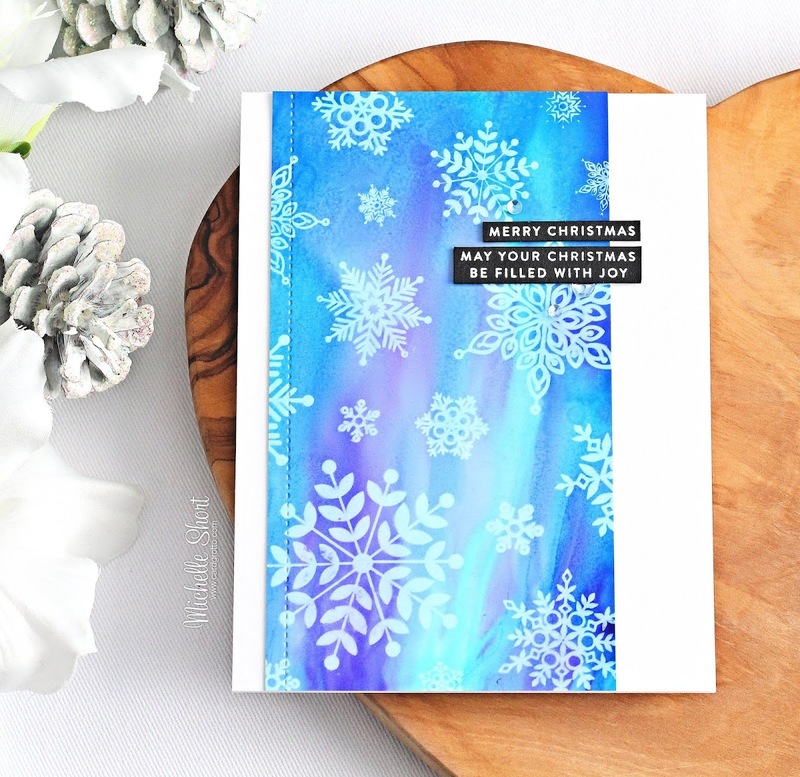 Beautiful Northern Lights colours & effect with the first card, your arc nd card looks very delicate & elegant. Glad you had fun making these. Two wonderful cards and I think the prettiest alcohol ink lift I have seen. 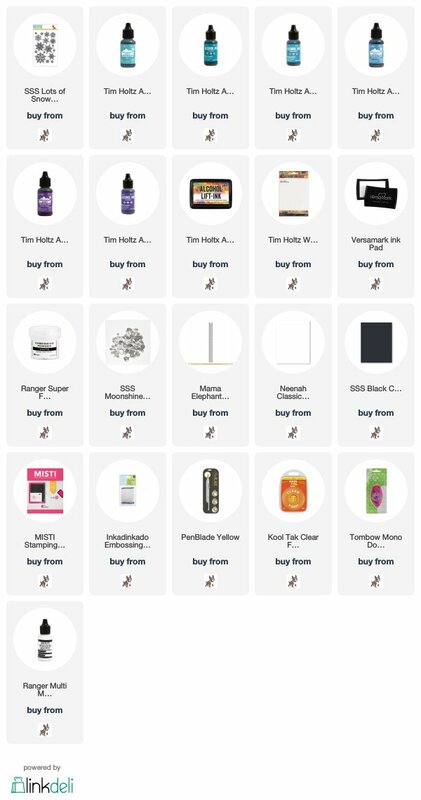 I thought you had white stamped it looks so clear and wonderful. Have to try this especially in these colours, so so pretty.